From the Gears of War Universe to your collection comes Kait Diaz! 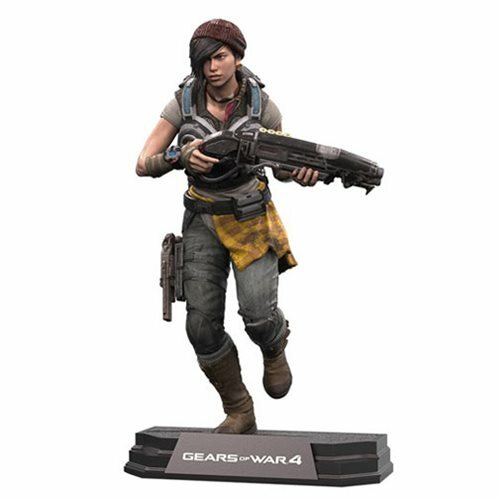 The Gears of War 4 Kait Diaz 7-Inch Color Tops Blue Wave #13 Action Figure includes one Gears of War 4 Gear Pack; a downloadable code for unlocking spectacular in-game content. Figure comes with customized Gnasher Shotgun and Boltok Pistol. The 7-inch tall action figure complete with stylized brand specific display base and comes packaged in a window display box. In Gears of War 4, after narrowly escaping an attack on their village, JD Fenix, and his friends Kait Diaz and Delmont Walker, must rescue the ones they love and discover the source of a monstrous enemy. Ages 12 and up.